A Conservative AM has said she is "ashamed" of her party's UK government over universal credit. 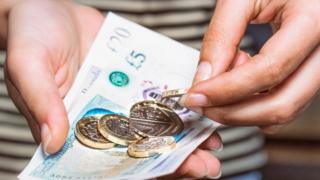 Angela Burns said that she "cannot understand" why a six or four week gap in payments under the new benefit is "deemed acceptable". Such a "cavalier attitude that the poorest can muddle through is callous at best and downright cruel at worst", she said in an email. The UK government and Ms Burns were asked for comment. Ministers are under pressure from more than a dozen Conservative MPs to pause the rollout of universal credit to fix problems with it, amid reports some families are being forced to wait more than six weeks for payments. An emergency debate is set to be held in Westminster later. The UK government has said that anyone struggling can receive bridging payments. In an email sent to Conservative AMs and staff, initially reported by ITV Cymru Wales, Ms Burns wrote: "I think this position is indefensible and if I'm challenged I will say so". "For the life of me I cannot understand why a 6 or 4 week gap is deemed acceptable," Ms Burns said. "It should be a seamless transition and it's not beyond the wit of man to make it so. "I'm all for UC and I agree the benefits system should be overhauled and people paid appropriately but this cavalier attitude that the poorest can muddle through is callous at best and downright cruel at worst. "I'm ashamed of my government."